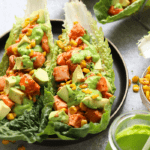 Lose the tortillas and make these Buffalo Chicken Lettuce Wraps for a healthy lunch throughout the week! They are gluten-free, packed with veggies, and extra flavorful when topped with green goddess dressing. These lettuce wraps are easy to meal-prep and great for an easy weeknight dinner. Happy Sunday, my people! I’m back in my old stomping grounds (Milwaukee and Chicago) for the weekend getting some much-needed QT with Marky’s family in Milwaukee and my fam in Chicago. 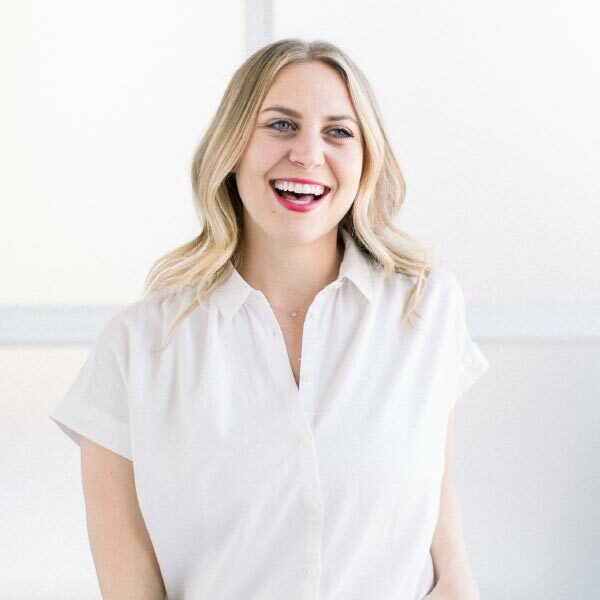 And tomorrow Lin and I are camping out at a coffee shop for a full-day Healthy Glow Co. strategy sesh with Monique before heading home for another fun week at FFHQ. Now that’s what I call a weekend well spent. Before we leave my parents’ casa you bet we’re going to set them up with these delish buffalo chicken lettuce wraps meal-prepped and ready for the week’s lunches. This recipe is easy-peasy and packed with SO. MUCH. FLAVOR. I’ve been craving all the greens lately, and even though Minnesota really can’t let go of winter this year, these lettuce wraps have me dreaming of patio dinners and lake walks. 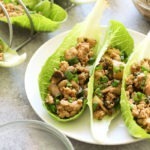 I mean, how perfect would these chicken lettuce wraps be for a picnic lunch?! Plus, they can be meal-prepped and stored in the fridge for the week so you can easily whip them together and be on your way. A win-win. When Lin and I were brainstorming for this buffalo chicken recipe, we knew we wanted to incorporate lettuce wraps. First: we know how much you love ditching the tortilla for a leafy green (find a few of our other fave lettuce wrap recipes are below! ), and second: we can’t get enough of this healthy green goddess dressing. Make these delicious lettuce wraps NOW and lettuce know what you think (see what I did there?)! 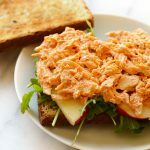 Lose the tortillas and make these Buffalo Chicken Lettuce Wraps for a healthy lunch throughout the week! They are gluten-free, packed with veggies, and extra flavorful when topped with green goddess dressing! Preheat oven to 375ºF and line a baking sheet with tin foil. Spray tin foil with cooking spray and set aside. In a small bowl, mix together garlic powder, paprika, salt and pepper. Then, rub both sides of chicken breasts with spices and place on baking sheet. Bake at 375ºF for 20-25 minutes or until fully cooked. Once chicken breasts are cool, cut into cubes and place into a medium-sized bowl. Whisk franks sauce and maple syrup together in a separate bowl and pour over chicken cubes. Mix until all chicken is covered with franks mixture. Set aside. Prepare your green goddess dressing by placing all ingredients in a blender or a food processor and blend until smooth. Place into the refrigerator until you are ready to eat the wraps. Assemble your wraps by laying out all of your lettuce leaves on a flat surface. Fill your leaves with an even amount of chicken, corn, and avocado. Lastly, drizzle about a 1/2 tablespoon of green goddess dressing over each lettuce wrap and enjoy! *Use any type of large lettuce leaf that you would like!